The other week, I discovered Azure Functions - thanks to Rob Miles. In the same moment, I thought that it would be fairly trivial to build a system by which you could self-host it - and shunction was born. Of course, the system can be upgraded at a later date to support additional operating modes. The last 2 in the list start a persistent and long-running process, which will only exit if terminated. Shunction is designed to run on Linux systems. Because of the shebang, any executable script (be it a shell script, a Python script, a Node.js script, or otherwise) is supported. If you've got multiple tasks you want have your server running and want to keep them all in one place, then shunction would allow you to do so. For example, you could keep the task scripts in a git repository that you clone down onto the server, and then use shunction to execute them as needed. Hello, and welcome to another blog post! I hope everyone had a lovely and restful Easter. Very often, I want to run a command on a remote machine via SSH and leave it in a terminal in 1 corner of my screen whilst I work in another terminal on that same machine. This is fine, but it takes a moment to connect & setup the terminal on the remote end. What if there was a way to specify the command to run remotely? I can't remember how I figured it out, but I discovered that the issue is that when you specify the command instead of letting the default shell initialise, it treats it as some sort of 'script-mode', and doesn't allocate a pseudo-terminal on the remote machine. Found this useful? Got another great SSH tip? Comment below! At the beginning of my time here at University I never thought I'd be planning and leading the delivery an entire workshop on the basics of Linux. Assessed coursework presentations have nothing on this! I think next time I want to better prepare for the gap when installing the operating system, as it took much longer than I expected. Perhaps choosing the "minimal" installation instead of the "normal" installation would help here? Preparing some slides on things like the folder structure and layout, and re-ordering the slides about package management would would all help. If I can't cut down on the installation time, pre-installed virtual machines would also work - but I'd like to keep the OS installation if possible to show that it's an easy process installing Ubuntu on their own machines. I unsure precisely what's meant by this. Is it installation of various games? Or maybe it's configuration of various platforms such as Steam? Perhaps someone could elaborate on it? I think for anything more advanced, I'll probably go with a lab sheet-style setup instead, so that people can work at their own pace - especially since something like server configuration has many different steps to it. I'm pretty sure I'll be doing another one of these sessions, although I'm unsure as to whether there's the demand for a repeat of this one. If you've got any thoughts, let me know in the comments below! Thanks also to @MoirkoB and everyone else who provided both time and resources to enable this to go ahead. Without, I'm sure it wouldn't have happened. I'm rather busy at the moment with University, but I thought I'd post about Linux's log rotating system, which I've discovered recently. This post is best read as a follow-up to my earlier post, creating a system service with systemd, in which I talk about how to write a systemd service file - and how to send the output of your program to syslog - which will put it in /var/log for you. When the logs are next rotated, the last one is deleted and all the rest are renamed sequentially - like 10 in the bed. Compressing log files is good for saving space, but in order to read them again we have to fiddle about with zcat / gzip. Recently I re-remembered about /dev/tcp - a virtual bash file system that allows you to directly connect to a remote TCP endpoint - without the use of nc / netcat / ncat. While it only allows you to connect (no listening, sadly), it's still a great bash built-in that helps avoid awkward platform-specific issues. The pv command there is not installed by default, but is a great tool that shows the amount of data flowing through a pipe. It's available in the repositories for most Linux distributions without any special configuration required - so sudo apt install pv should be enough on Debian-based distributions. Very neat! We've been able to eliminate an extra child process. The question is though: how do they compare performance-wise? Well, that depends on how we measure it. In my case, I measured a single connection, downloading data as fast as it can for 60 seconds. Another test would be to open many connections and download lots of small files. While I haven't done that here, I theorise that the pure-bash method would win out, as it doesn't have to spawn lots of subprocesses. As it turns out, the pure bash method is apparently faster - by ~8.8%. I think this might have something to do with the lack of the additional sub-process, or some other optimisation that bash can apply when doing the TCP networking itself. Found this interesting? Got a cool use for it? Discovered another awesome bash built-in? Comment below! I've recently been setting up dotnet on my Artix Linux laptop for my course at University. 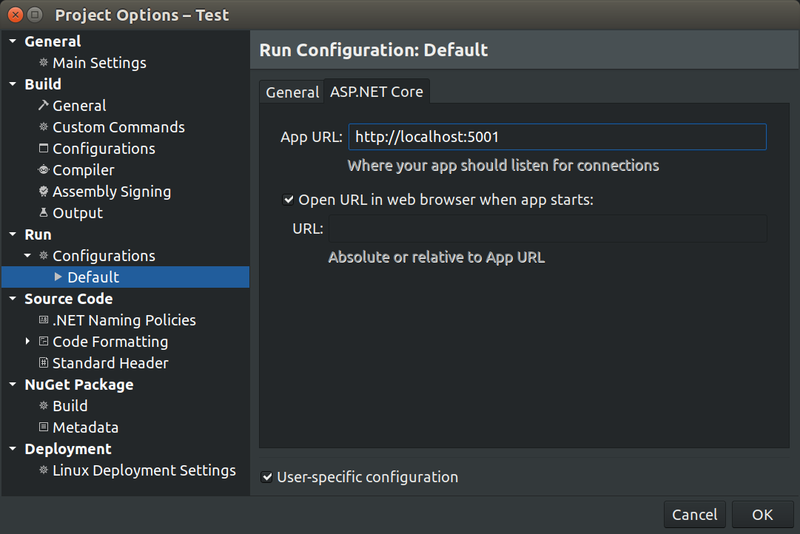 While I'm unsure precisely what dotnet is intended to do (and how it's different to Mono), my current understanding is that it's an implementation of .NET Core intended for developing and running ASP.NET web applications (there might be more on ASP.NET in a later 'first impressions' post soon-ish). While the distribution is somewhat esoteric (it's based on Arch Linux), I've run into a number of issues with the installation process and getting Monodevelop to detect it - and if what I've read whilst researching said issues, they aren't confined to a single operating system. Since I haven't been able to find any concrete instructions on how to troubleshoot the installation for the specific issues I've been facing, I thought I'd blog about it to help others out. Monodevelop + dotnet = headache? Turns out that it's a known bug. Sadly, there doesn't appear to be much interest in fixing it - and neither does there appear to be much information about how Monodevelop does actually detect a dotnet installation. sudo find / -mount -type d -name "dotnet"
Success! This gave a list of all directories on my main / root partition that are called dotnet. From there, it was easy to pick out that it actually installed it to /opt/dotnet. This fixed the issue, allowing Monodevelop to correctly detect my installation of dotnet. Thinking my problems were over, I went to create a new dotnet project following a tutorial. Unfortunately, I ran into a number of awkward and random errors - some of which kept changing from run to run! Apparently, the template projects generated by the dotnet new subcommand are horribly broken. To this end, I re-created my project through Monodevelop with the provided inbuilt templates. I was met with a considerable amount more success here than I was with dotnet new. The last issue I've run into is a large number of errors relating to the support for HTTPS that's built-in to the dotnet SDK. Unfortunately, I haven't been able to resolve these. To this end, I disabled HTTPS support. Although this sounds like a bad idea, my reasoning is that in production, I would always have the application server itself run plain-old HTTP - and put it behind a reverse-proxy like Nginx that provides HTTPS, as this separates concerns. It also allows me to have just a single place that implements HTTPS support - and a single place that I have to constantly tweak and update to keep the TLS configuration secure. In a production environment, you'll probably have your reverse-proxy configured to do this HTTP to HTTPS redirection anyway - another instance of separating concerns. By the looks of things, you'll have to do this 2nd step on every machine you develop on - unless you also untick the "user-specific" box (careful you don't include any passwords etc. in the environment variables in the opposite tab in that case). You may wish to consider creating a new configuration that has HTTPS disabled if you want to avoid changing the default configuration. Found this useful? Got a related issue you've managed to fix? Comment below! I've been looking to setup a personal VPN for a while, and the other week I discovered a rather brilliant project called PiVPN, which greatly simplifies the process of setting one up - and managing it thereafter. It's been working rather well so far, so I thought I'd post about it so you can set one up for yourself too. But first though, we should look at the why. Why a VPN? What does it do? Basically, a VPN let you punch a great big hole in the network that you're connected to and appear as if you're actually on a network elsewhere. The extent to which this is the case varies depending on the purpose, (for example a University or business might setup a VPN that allows members to access internal resources, but doesn't route all traffic through the VPN), but the general principle is the same. Everyone on the Café's WiFi can see the internet traffic you're sending out. If any of it is unencrypted, then they can additionally see the content of said traffic - e.g. emails you send, web pages you load, etc. Even if it's encrypted, statistical analysis can reveal which websites you're visiting and more. Then, all that the other users of the Café's WiFi will see is an encrypted stream of packets - all heading for the same destination. All they'll know is roughly how much traffic you're sending and receiving, but not to where. This is the primary reason that I'd like my own VPN. I trust the network I've got setup in my own house, so it stands to reason that I'd like to setup a VPN server there, and pretend that my devices when I'm out and about are still at home. In theory, I should be able to access the resources on my home network too when I'm using such a VPN - which is an added bonus. Other reasons do exist for using a VPN, but I won't discuss them here. The 2 main technologies I came across were OpenVPN and IPSec. Each has their own strengths & weaknesses. An IPSec VPN is, apparently, more efficient - especially since it executes on the client in kernel-space instead of user-space. It's a lighter protocol, too - leading to less overhead. It's also much more likely to be detected and blocked when travelling through strict firewalls, making me slightly unsure about it. OpenVPN, on the other hand, executes entirely in user-space on both the client and the server - leading to a slightly greater overhead (especially with the mitigations for the recent Spectre & Meltdown hardware bugs). It does, however, use TLS (though over UDP by default). This characteristic makes it much more likely it'll slip through stricter firewalls. I'm unsure if that's a quality that I'm actually after or not. Ultimately, it's the ease of management that points the way to my final choice. Looking into it, with both choices there's complex certificate management to be done whenever you want to add a new client to the VPN. For example, with StrongSwan (an open-source IPSec VPN program), you've got to generate a number of certificates with a chain of rather long commands - and the users themselves have passwords stored in plain text in a file! While I've got no problem with reading and understanding such commands, I do have a problem with rememberability. If I want to add a new client, how easy is that to do? How long would I have to spend re-reading documentation to figure out how to do it? Sure, I could write a program to manage the configuration files for me, but that would also require maintenance - and probably take much longer than I anticipate to write. I forget where I found it, but it is for this reason that I ultimately decided to choose PiVPN. It's a set of scripts that sets up and manages one's an OpenVPN installation. To this end, it provides a single command - pivpn - that can be used to add, remove, and list clients and their statistics. With a concise help text, it makes it easy to figure out how to perform common tasks utilising existing terminal skills by conforming to established CLI interface norms. The static IP address it talks about is the IP address of your server on the local network. The installation asks about the public IP address in a later step. If you've already got a static IP setup on your server (and you probably have), then you don't need to worry about this. It asks you to install and enable unattended-upgrades. You should probably do this, but I ended up skipping this - as I've already got apticron setup and sending me regular emails - as I rather like to babysit the upgrade of packages on the main machines I manage. I might look into unattended-upgrades in the future if I acquire more servers than are comfortable to manage this way. Changing the port of the VPN isn't a bad idea, since PiVPN will automatically assemble .ovpn configuration files for you. I didn't end up doing this to start with, but I can always change it in the NAT rule I configured on my router later. Don't forget to allow OpenVPN through your firewall! For ufw users (like me), then it's something like sudo ufw allow <port_number>/udp. Don't forget to setup a NAT rule / port forwarding on your router if said server doesn't have a public IP address (if it's IPv4 it probably doesn't). If you're confused on this point, comment below and I'll blog about it. It's..... a complicated topic. If you'd like a more in-depth guide to setting up PiVPN, then I can recommend this guide. It's a little bit dated (PiVPN now uses elliptical-curve cryptography by default), but still serves to illustrate the process pretty well. Question: How do you recover a deleted file that's been overwritten? Answer: With the greatest of difficulty. Recovery of deleted files is awkward at best. It relies on the fact that when you 'delete' something, it doesn't erase it from disk at all - just deallocates the sectors on disk that it was taking up and re-enters them into free pool of space - which is then re-used at will. The most important thing to remember when you've just lost something is to not touch anything. Shutdown your computer, and, if you're not confident enough yourself, call someone who knows what they're doing to help you out. The best way to recover a file is to boot into a live cd. This is a CD (or flash drive) that holds an (or multiple!) entire operating system(s). This way, no additional writing is done to the disk containing the deleted file - potentially corrupting it. After fiddling about with this (I had to update my bootable flash drive, as Ubuntu 15.10 is out of support and I couldn't download the extundelete tool, whichI'll mention shortly), I found that I'd hit a dead-end. I suspect that it was getting confused because I had a file by that name on disk that was now empty. Anyway, after doing something else for a while, I had an idea. Since my blog posts are just text files on disk, shouldn't it be on my disk somewhere? Could I locate it at all? sudo dd if=/dev/sda7 | strings | grep -i "AWS S3"
dd - This reads in the entire contents of a partition and pushes it into the following command. Find the partition name with lsblk. strings - This extracts all runs of printable characters from the input stream. sudo dd if=/dev/sda7 | strings | grep -i -C100 "To start, we'll need an AWS S3 bucket"
This time, I added -C100. This tells grep that I want to see 100 lines before and after any lines that contain the specified search string. With this, I managed to recover enough of the blog post to quickly re-edit and upload it. It did appear to remove blank lines and the back-ticks at the end of a code block, but they are easy to replace. Note to self: Always copy first when crossing file system boundaries, and delete later. Don't move all in one go! Recently I've looked at using AI to extract key information from natural language, and creating a system service with systemd. The final piece of the puzzle is to write the bot itself - and that's what I'm posting about today. Since not only do I use XMPP for instant messaging already but it's an open federated standard, I'll be building my bot on top of it for maximum flexibility. To talk over XMPP programmatically, we're going to need library. Thankfully, I've located just such a library which appears to work well enough, called S22.XMPP. Especially nice is the comprehensive documentation that makes development go much more smoothly. With our library in hand, let's begin! Our first order of business is to get some scaffolding in place to parse out the environment variables we'll need to login to an XMPP account. Excellent! We're reading in & parsing 2 environment variables: XMPP_JID (the username), and XMPP_PASSWORD. It's worth noting that you can call these environment variables anything you like! I chose those names as they describe their contents well. It's also worth mentioning that it's important to use environment variables for secrets passing them as command-line arguments cases them to be much more visible to other uses of the system! // TODO: Automatically reconnect to the server when we get disconnected. Cool! Here, we create a new instance of the XMPPClient class, and attach 3 event handlers, which we'll look at later. We then connect to the server, and then wait until it completes - and then write a message to the console. It looks like S22.Xmpp spins up a new thread, so unfortunately we can't catch any errors it throws with a traditional try-catch statement. Instead, we'll have to ensure we're really careful that we catch any exceptions we throw accidentally - otherwise we'll get disconnected! It does appear that XmppClient catches some errors though, which trigger the Error event - so we should attach an event handler to that. /// Handles any errors thrown by the XMPP client engine. /// Handles requests to talk to us. /// Only allow people to talk to us if they are on the same domain we are. /// it offers some measure of protection. This simply allows anyone on our own domain to talk to us. For development purposes this will offer us some measure of protection, but for production you should probably implement a whitelisting or logging system here. /// Sends a chat message to the specified JID. /// Sends a chat message in direct reply to a given incoming message. The difference between these 2 methods is that one sends a reply directly to a message that we've received (like a threaded reply), and the other simply sends a message directly to another contact. Excellent! That's our bot complete. The full program is at the bottom of this post. Of course, this is a starting point - not an ending point! A number of issues with this demo stand out. There isn't a whitelist, and putting the whole program in a single file doesn't sound like a good idea. The XMPP logic should probably be refactored out into a separate file, in order to keep the input settings parsing separate from the bot itself. Other issues that probably need addressing include better error handling and more - but fixing them all here would complicate the example rather. Found this interesting? Got a cool use for it? Still confused? Comment below!